Cross-border brigades contained the IRA’s top killers. It was the extreme that suppressed less radicalised views within the organisation. By the mid 1980s a successful cross-border IRA murder spree threatened to destabilise the entire state by plunging Northern Ireland into a full blown sectarian civil war, which was the aim of cross-border brigades. Any hope of achieving this, however, was extinguished on the 8th May 1987 when the most ambitious brigade - East Tyrone/Monaghan IRA - suffered a humiliating setback at Loughgall. Not only did the Loughgall incident signal the decline of the IRA cross-border offensive, it also signalled the decline of the IRA terrorist campaign. East Tyrone/Monaghan IRA contained irreconcilables like James Lynagh and Patrick McKearney. Both were on-the-runs, fugitives from the law in Northern Ireland who lived in border counties in the Republic of Ireland. Much to the frustration of the British, the Republic did not treat on-the-runs as terrorists. Lynagh and McKearney were the driving force behind most IRA murders in Tyrone and many others in the neighbouring counties for at least a decade prior to the Loughgall incident. For younger brigade members, Lynagh and McKearney were living legends, republican icons, someone they aspired to be. To Special Branch, they were streetwise homicidal maniacs and the main impediment to ending the conflict. Most law-abiding citizens believed people like Lynagh were unstoppable and beyond the reach of the law. Lynagh also believed this, which meant he had a false sense of his own operational value. McKearney was similarly deluded. This is because Lynagh and McKearney confused murdering soft targets in surprise attacks with combat. They were criminals not combatants. Psychopaths not soldiers. They were intoxicated by republican myths and had lost touch with reality. They did not appreciate that the first time they came up against soldiers trained in combat without having the element of surprise as an advantage, would be their last. In a violent ten minutes the entire brigade command had been wiped out. All the assailants killed were known to SB and linked to previous murders. Unknown to Special Branch beforehand was exactly who would participate, as there were other active members (some of who were killed in later covert operations). What was likely, however, was that Lynagh and McKearney would be involved. For the IRA it was the largest loss of life in a single incident during the conflict and came at a time IRA confidence was high. When the attack occurred the only people in Loughgall police station were two constables of SB’s specialist firearms team – E4 HMSU (Headquarters Mobile Support Unit) – and six SAS. Also present was a uniform constable stationed there, according to one of the E4 HMSU officers involved. All those who would normally have been in the station, with the exception of one, had been replaced by covert specialists. The scene at Loughgall RUC station where 8 IRA men were shot dead in 1987. What follows is largely a synopsis of one of the E4 HMSU officer’s experience. He states that he and his colleague had volunteered to be in the station, as had the local officer who was essential to the plan. The rest of the E4 HMSU performed an outer cordon for the SAS as a Quick Reaction Force (QRF), as opposed to being close in and part of the immediate response. Twenty-six SAS were involved in total, with those outside hiding in fields and woodland close to the station. Both E4 HMSU officers had to protect the local uniform officer when anyone called at the station, as there was concern that an insurgent pretending to be an innocent caller would trigger the attack by shooting the first officer he met. Despite Loughgall being limited opening, which meant it closed at 7pm to the public, 7.00pm to 8.00pm was guaranteed to have several officers inside doing paperwork. IRA reconnaissance would have yielded this fact. Throughout the day, to any passer-by there was a visual appearance that there was no change of routine. The attack took place at 7.30pm. Patrick McKearney and a few more were wearing concealed body armour. Some attackers had ammunition magazines tapped together for quick reloads and others had extra ammunition magazines and loose rounds carried in their pockets. All of them wore balaclavas, surgical gloves and many had socks over their shoes, all of which was to guard against being identified or leaving forensic evidence behind. The attack had all the hallmarks of preparing for a close-quarter shoot. One of their weapons, a Ruger revolver, was taken off constable Clements’ dead body at Ballygawley and had been used in three murders since. Ballistic traces on the rest of the firearms would almost certainly evidence similar provenance. Around the same time a blue Hiace van, which was to transport the gun team, was acquired in similar fashion. The van parked outside the station and the gun team debussed, directing sustained fire at the station during which the digger got into position. Six attackers armed with automatic military rifles all fired. A loaded pistol was recovered in the rubble near the digger (driven by Declan Arthurs) and a spare pump action shotgun was in the van. 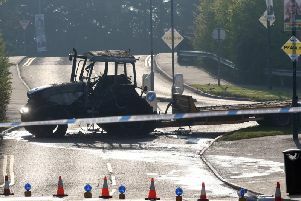 Seconds after the terrorists opened fire the Ford digger with its raised bucket crashed through the fence. Within seconds an explosion destroyed most of the building and injured all those inside, the most serious being an E4 HMSU officer who suffered severe head injuries. The soldiers outside believed no-one inside had survived; such was the enormity of the blast. And everyone inside was amazed they were still alive. As well as killing everyone inside and stealing weapons and documents, the attack was also about demoralising the police and sending out a loud signal to Westminster that Northern Ireland was ungovernable, a failed state. As it was, it had the opposite effect. For a beleaguered police force and a long-suffering public, what happened at Loughgall convinced many for the first time that the IRA was beatable. Loughgall was the beginning of the end. See also this News Letter report from 2015 – one of the paper’s most-read stories of recent times – which revealed details of an act of tribute to the Loughgall IRA men in which Labour leader Jeremy Corbyn participated.